Pomatomus finished-- way awesome. They look a bit fraternal yet knit from the same hank of Fleece Artist merino; one is much more pink, the other much more blue/yellow. I'm thinking if this hank was knit st st it would show up much more. Also had pooling on the foot of both but not the cuff (I don't mind pooling, actually). 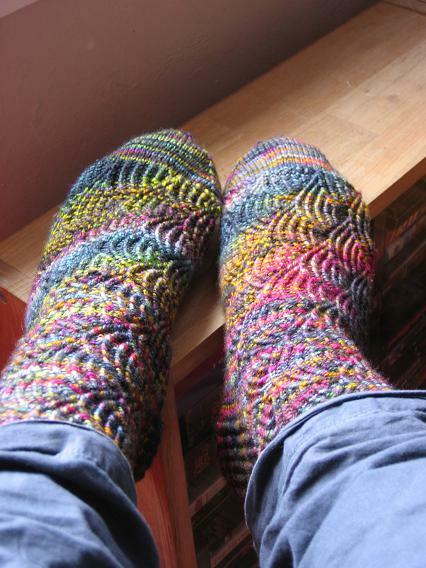 The ribbing is very comfortable, and molds the sock well to the foot. Knit thru 3 full repeats of chart b, then dec toe to 16 st total. So so so so so pretty, quikeye!!! You are a sock goddess! Those are really very cool looking! Those are really cool. Amazing combination of colors and patern.